I have a problem to solve which will help with shadows, but it doesn't seem to be something either Google or my brain can readily provide. A list of extra edges I want to add in order to expand the volume. (Optionally - I know how to compute this, but it might be unnecessary) a collection of points which are now inside the hull instead of on its boundary, so need removing from edges. A list of edges forming the boundary of the volume now it's bigger, but with no edges which pass through the inside of the volume. It's really easy to get rid of the edges which are connected to points that have ended up inside the new volume - when you know which those points are, you just delete any edges with those points. However, there can be edges between points that are still on the boundary, but pass through the volume. For example, in the case of this tetrahedron if the volume contained by the orange lines is added, the bottom edge of the tetrahedron is no longer needed as it's completely enclosed by the new volume. 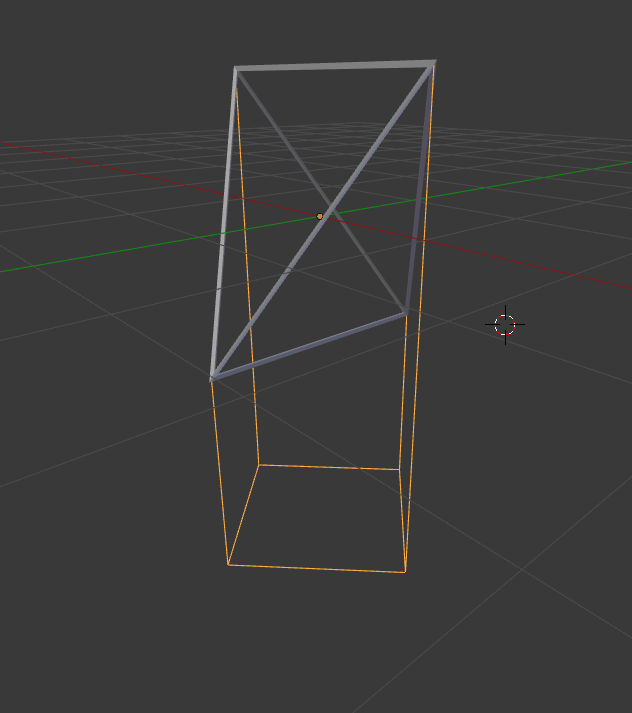 The problem is detecting this without also deleting the top edge of the tetrahedron - both are edges between a pair of vertices which are still in the hull that make up non-adjacent points of the loop of vertices connected to new edges. With a normal convex hull system represented by either vertices or planes, there are published solutions as it's a common thing to do. All of the mathematically simple approaches I can think of which work in theory will fail due to floating point error with edges, though, and the range of the input to the algorithm is too big to pick an epsilon value that should always work. I tried using a convex hull implementation from Bullet, but it isn't reliable enough, sometimes producing garbage data, and looking at the implementation, it looks like I'm just feeding it worst-case data rather than hitting any bugs. It's only designed to be good enough to produce approximate collision shapes rather than be mathematically sound. There's potentially a solution which involves considering all of the edges connected to a vertex, working out which of those form an open-ended convex hull, and discarding things in the middle, but I've failed to convince myself that any of the things I've thought of to achieve that would be free from edge cases. So basically I'm asking if anyone has any ideas or is willing to do some thinking with me. Why do you need to delete the line? Why do you need to add the second shape to the first? Can you calculate if a point is inside the whole shape? Can you form triangles from sets of points and calculate their norm? Can you calculate if a point on that norm (that is infinitely close to the triangle but not in the plane of the triangle itself) is inside the shape? If you could, if a triangle had norm points contained within the shape on both norms going in opposite directions, then one of the edges of the triangle is inside the shape, isn't it? And if another triangle was also inside the shape and shared an edge with the first bad triangle, then that shared edge would be the one to be deleted? This is challenging to describe but here goes. Imagine you were holding this wireframe shape in your hands. Now you can look at it from all different directions. Now pick an edge, E, and look directly along it so that it becomes a point. In other words, project the wireframe onto a plane where the edge E is orthogonal to that plane. If you're still with me and can picture this, then I think you might see a point in the middle, which is E, and number of connecting edges going off in different directions. What I think is relevant are the angles between these connecting edges. If you cannot find an angle greater than or equal to 180, then I would imagine that this edge must travel through the interior of the convex hull. Last edited by PatDaRat on 16 Aug 2018, 12:13, edited 1 time in total. A line segment is not an edge of a polyhedron/volume, if its midpoint (or any other point besides the end points) is inside the polyhedron, or conversely, it is an edge of the polyhedron, if its midpoint is on the boundary of the polyhedron. 1. Ignore the edge data you are given and just take all vertices of all edges and create from this a data structure from which you can easily deside (strict) containment in the convex hull. 2. Test for each edge, if the midpoint is inside the convex hull and not on the boundary. Another idea is to find at each vertex the set of line segments which form edges in the polyhedron. This is probably slower than the previous approach, but might be more in line of what you were thinking about. 3. Intersect all rays starting in v and formed by the edge directions with the plane. Now find the intersections, which form the convex hull. All other come from edges, which are inside the polyhedron. I guess after thinking about it a little further, what i'm essentially saying is that an edge can only be a valid edge of the convex hull if there exists a plane that can rest against this edge without intersecting any of the other edges. By analysing the angles I put forward in my previous post, you can show whether such a plane exists or not. All of these posts seem to be forgetting that if a point is on a plane, I can't find this out - depending on how the rounding happens to come out, there's a 50% chance of it being flagged as on one side of the plane and a 50% chance of it being flagged as on the other side, but a 0% chance of it being flagged as on the plane. I had thought about a system using the midpoints of edges, but the midpoints of all edges are on planes, and therefore have a good chance of being flagged as inside the volume. Another function that needs to be run on the volume afterwards will fail if it is ill-formed. The first shape represents a portion of the view frustum. The second represents the space between it and the sun. Together, they represent the volume which shadow casters can occupy. I can do this with a 50% false positive rate for things on the border, but all of the edges I want to keep are on the border, so half of those would be removed. That's not terminology I recognise, but when I see the word close, my default response is going to be that the results will be wrong 50% of the time. So I project everything into 2D, looking along an edge, work out the bearing of each of its neighbours, and check at least one of the gaps is above 180°? This actually seems like it might be viable. It's like a few other ideas I had, but I'm not seeing any of the pitfalls, and it passes my 'stab some cocktail sticks into an eraser and see if it works' test. I shall conduct further testing. Due to rounding errors, I can't test if something is on the boundary - it's either on one side or the other, and things close to the boundary have a 50% chance of registering as on either side. That breaks this. It's something I've already tried. This is another thing I'd already thought of, but sliding the plane is where it fails - the scale of input the data can change by many orders of magnitude, even for one volume (parts of the added volume use -DBL_MAX and the original volume can sometimes range between 0.9998 and 0.9999). If the plane is slid far enough to soak up the rounding error for the big numbers, it also soaks up the whole range of the small numbers. Picking a plane normal is also harder than just taking the average - if there are enough edges in one direction, the plane will face that direction, which is only acceptable if lines are constrained to 90°. A good normal is the average of just the minimum and maximum edges in an orthogonal plane, and then everything starts to get circular, with things requiring their own results to exist before they can be computed. I'm going to try a prototype of PatDaRat's solution as it's the only thing to pass both the 'stab some cocktail sticks into an eraser and see if it works' test and the 'doesn't require testing against planes' test. Is it right to say that this shape will always be the same, just with different sizes and orientations? Is the "top" of the shape in the image always going to be closest to the viewer? Can you calculate the distance between the viewer and the endpoints of the lines? If so, could you order the endpoints by distance to the viewer and then delete the line between endpoints 3 and 4 out of 8? The answer to all of those is no. The prototype version of PatDaRat's idea seems to be working flawlessly, though, so I'm going to get it into C++ and hopefully it'll work. Would it be better to move this conversation to the Content Development Section? Or is it related somehow to OpenMW development?